The Haida Heritage Centre is a unique building in Haida Gwaii, B.C. 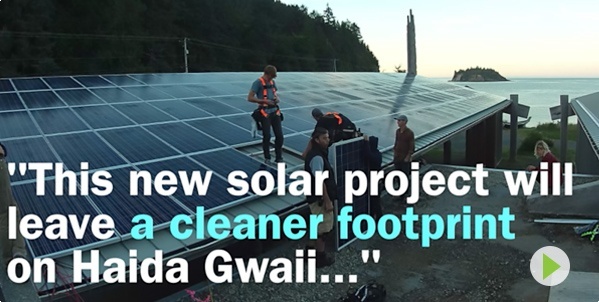 that features a solar rooftop that will reduce the community's reliance on fossil fuels. Thanks to you, Bullfrog helped fund the project—in partnership with W Dusk Energy and the Skidegate Band Council. See some amazing shots of the project in our video! Don Ross, an environmental advocate and bullfrogpowered customer for more than 10 years, shares his thoughts in a special guest blog post on our consumption of plastic—and what we can do to fix it! Read more. Longtime Bullfrog customer and SolarShare co-founder Mike Brigham inspects a new, 4 MW solar project near Timiskaming, ON—rocking his Bullfrog hat, of course! SolarShare is an Ontario co-op financing dozens of solar projects across the province, and the bullfrogpowered community is a proud supporter of SolarShare's efforts. Sunnyside Market blog: What's in a label? There can be a lot of labels to consider when buying food—so many that it can be difficult to keep track! Luckily, bullfrogpowered Sunnyside Market has a handy blog post explaining the labels you might find on food products, what they mean, and why they matter. Sunnyside is also working on its own non-GMO verification process—click here to learn about the Sunnyside Verified Project. Passive House, or Passivhaus in its native German, is a building standard that measures a structure's energy efficiency and environmental footprint, emphasizing architectural features such as window placement, wall colour and landscaping. Bullfrogpowered Naikoon Contracting is a green builder in Vancouver specializing in Passivhaus, Built Green and LEED Canada certifications, and more—check out their blog to learn more and see their latest projects.